House for sale stock photo from Andy Dean Photography/Shutterstock. While public attention has been focused on his high-profile blackface scandal, Virginia Governor Ralph Northam quietly signed an important housing law on February 21. SB1373 will have a direct impact all over the state on the cost and availability of a house, the average person's biggest and most important purchase. The passage of the 2019 “fix” to the 2016 “reform” means that an impediment to increasing the local housing stock has been removed. The bill was sponsored by Arlington-based Virginia State Senator Barbara Favola (D-District 31) and passed the Virginia Senate by a vote of 29-10 and the House of Delegates by 92-7. It will go into effect July 1. But, as a 2014 opinion column about the “unique-to-Virginia” proffer system in the Richmond Times-Dispatch noted: "In theory, proffers are voluntary. In practice they're about as voluntary as the money you fork over to a tow-truck company to get your car out of the impound lot." The sense that developers were at the mercy of local officials is what led to the passage of the 2016 Proffer Reform Act, which was co-sponsored by Springfield-based State Senator Richard Saslaw (D-District 35). As a 2017 article in the Richmond Public Interest Law Review put it: "In spite of a laudable original intent and the early support of the development community, the proffer system has been the subject of regular criticism and legislative modification in recent years as certain localities across the Commonwealth have become more and more reliant on the system as a salve for impacts arguably not directly (or even indirectly) caused by the relevant development." The article goes on to say the 2016 legislation: "was promoted by the building industry as a means of restoring a modicum of reason and fairness to a process that had, in the eyes of its proponents, morphed in some localities from a system of voluntary mitigation to one of forced exaction." However, a modicum of reason and fairness was not the result once the 2016 legislation came into effect. Instead, after a rush to get proffers through before the new law took effect, the result was a drop in proposed new housing, which made no one happy except people who wished to slow development. A Stafford county supervisor called the 2016 legislation a “blessing in disguise” because it “tied the hands” of county officials in negotiations with developers. The 2016 law made both elected officials and local government staff extremely reluctant to negotiate proffers. As that law was written, the moment any government official would “request,” orally or in writing, a proposal that fit the law's definition of an “unreasonable” proffer, the official would be in violation of the law. The aspiring home-building developer would be “entitled to an award of reasonable attorney fees and costs” plus an order to approve the rezoning request in question. “It tended to make the dialogue quite frankly very stilted,” said Fred Selden, Director of Fairfax County's Department of Planning and Zoning. The new 2019 version strikes the word “request” and substitutes “require,” which means that possibly unacceptable proffer ideas can be uttered during negotiations without immediately supplying home-builders with a basis for legal action. In both the old and the new version of the law, proffers come in two flavors: “on-site” and “off-site.” An on-site proffer results in activity within the boundaries of the development. An example: planting a row of trees to screen the new development from its neighbors. An off-site proffer has impact outside the development. An example: a cash contribution to the local school district to educate anticipated new enrollees living in the new development. The 2016 law defined acceptable off-site proffers especially strictly. Selden says that the 2019 revision to the proffers law has removed the prohibition on suggesting a possible unreasonable proffer. In the period between the end of the 2008 financial crisis and the passage of the 2016 proffer reform law, the amount of proffer money Virginia localities collected more than doubled, from a little over $42 million in 2009 to near $100 million in 2016, according to a Virginia Department of Housing and Community Development (DHCD) document. 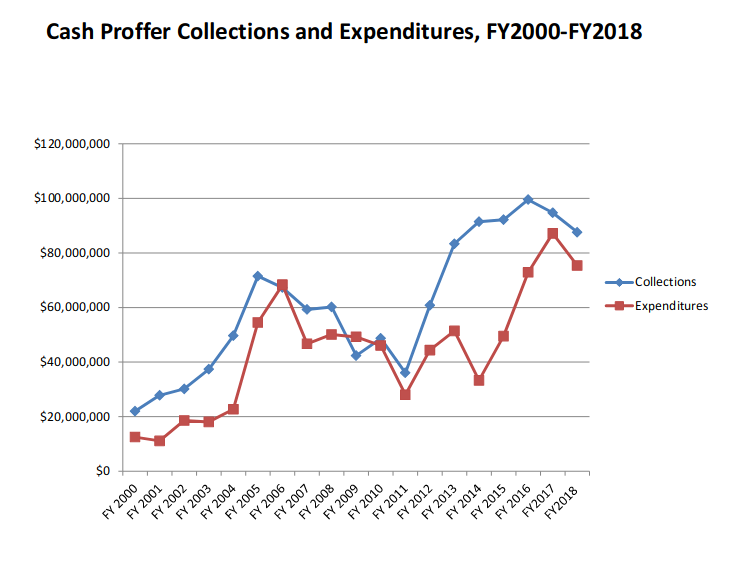 Since that time, proffer collections have fallen about 10%, to below $88 million (see DHCD chart below). Note that these figures do NOT include the value of non-cash proffers during this period. Proffers in the Virginia suburbs of DC are largely for “in-fill” developments. The amount of money is relatively small potatoes compared to the compensation that changes hands when builders construct completely new housing developments, as happens in Loudoun and Prince William counties and further afield. With this barrier removed, home-builders and localities are now freer to discuss creative solutions that will allow new developments to be more walkable, bikeable, and perhaps even affordable. David McAuley is an English teacher and blogger who lives in Arlington. He has written about Advisory Neighborhood Commissions (ANCs) for Borderstan and Popville, and was the founder of the ANC blog Short Articles about Long Meetings.